In October 2014 we flew two 17 year-old students from Lawhill Maritime Centre in Simon’s Town, South Africa to participate in the Ibiza Rendezvous Regatta, in Spain. The two lucky youngsters arrived in Palma de Mallorca on the 4th October and – after having an orientation visit to the super-yacht shipyards and marinas of Mallorca (visiting a total of eight very different and grand super-yachts upon kind invitation of the yachts’ captains and owners) – they sailed over to the island of Ibiza (100 nautical miles) on the 6th of October as crew aboard the schooner Yacht “Aloha-J of Cariba” to participate in the Rendezvous sailing program. They were invited as participating crew-members by the owners of this magnificent old classic yacht, and accompanied by Phil and Anthony as their seamanship mentors and guides. During the crossing both students carried out all of the required tasks at hand, from checking the engine-room and starting the engine, to conducting anchoring procedure, to course-planning, navigation, sail-changes and trimming, helming, galley-work, and wash-down duties. After a busy first day of sailing, an idyllic full moon and al-fresco dinner of seaman’s stew awaited the tired crew as the boys dropped anchor in the protected waters off Tagomago Island at the north-east corner of Ibiza – a welcome anchorage after an exciting day at sea. Following an early start down the coast to Ibiza Town in the morning – and a further man-over-board drill prior to the racing event – the boys brought ‘Aloha-J of Cariba’ safely and securely into the Marina Ibiza berth. Race preparation and registration for the event followed, and Bradley and Ronaldo were able to meet and socialize with the crews and owners of the other participating yachts. An exiting two pursuit-races followed, and the Friday race in particula – with a fine 20 knot breeze and a magnificent course selected by the Race Committee – provided the real climax of the event, with ‘Aloha-J’ showing her true mettle and completing an exciting and nail-biting finish against the De Savary owned schooner ‘Silver Spirit’ just off Ibiza Town. Due to very little wind on the Saturday, the final race was unfortunately cancelled, but this provided a great opportunity for the race-fleet to anchor en-masse off Salinas Beach and venture ashore to enjoy a fine lunch and some swimming in the pristine waters of Ibiza. What an event and experience in the lives of these two young men. They were great ambassadors for their native South Africa and Namibia, and were warmly welcomed and embraced by all whom they met during the regatta. After this fine event the boys sailed the old schooner back to Mallorca by night, experiencing night navigation and watch-keeping for the first time, and bringing the yacht safely into her berth in Palma under our supervision in the early hours of the Monday morning. After an early wake-up call, it was off to the airport, and the boys flew back to South Africa via Frankfurt. Their enthusiasm and wonder at the experience that they had enjoyed was clear to all who welcomed them back at Cape Town airport, and they could not stop talking in the car on the way home..! 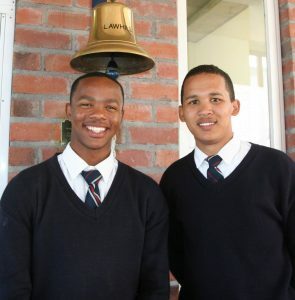 Their report-back to the Admiral and 200 other guests and students in Simon’s Town that night at the Lawhill Centre Annual Prize-Giving, allowed them to share first-hand the exciting tales of their adventure in Spain. Their Air-fares were sponsored by two individual yachting supporters, and other kind supporters provided the funds for other costs related to the event, including spending money for the boys, travel-insurance cover, provisioning, yachting uniform, and other shore-side costs. We thank very much Spike Thompson and the organizers of the Ibiza Rendezvous for sponsoring our entry fee for the regatta, and specifically thank Mallorca Accommodation, Ticket Viages of Portals, Annette Forsythe, Mallorca Clothing Company, Antonio Cruz Puerto, Colin Squire of Yachting Matters, Anne Wade, Marina Ibiza, and all of the other organizers for a most wonderful experience for Bradley and Ronaldo – made possible by the warm support and generosity of these friends of Marine Inspirations. Apart from their sailing experiences, Bradley and Ronaldo also had the chance to explore some of the cultural and historical highlights of Mallorca and Ibiza. An exciting future path to careers at sea, and their first-steps abroad and into the dynamic world of maritime, have been made possible for these two 17 year-olds by the great support that our empowerment initiative has received from many quarters. Thanks to all…! and good luck to Bradley and Ronaldo in their future careers…! The Ibiza Rendezvous is the first ever superyacht regatta to embrace the iconic island of Ibiza, in the Balearic Islands of Spain. The event was held in the closing days of the summer festivities, between the 8th and 11th of October, and coincided with the last big party-week of the summer season, while embracing the ever-perfect sailing conditions offshore from Ibiza Town and Formentera. Spike Thompson, founder of the Palma Superyacht Cup, the very first and longest running superyacht sailing regatta in the world, is behind this exciting new event in the sailing calendar, with the aim of “bringing back the fun!” to sailing regattas – where super-competitiveness and uber-professionalism have steadily crept into other existing regatta events in recent years. The event incorporated pursuit racing, and entrants were divided into several classes, including superyachts, yachts from 17m plus, and for the first time, motor-yachts were invited to join in the action. By day the fleet raced in the emerald seas around the dramatic and picturesque south-western coast of Ibiza and Formentera. On land at the regatta village the crews enjoyed a bustling social programme after the races, experiencing local restaurants and culture, and some crew-members – if of age – sampled the vibrant nightlife for which the island is famed. This was a chance to end the Mediterranean summer cruising-and-racing programme in style on a nautical note, to explore the hidden gems of Ibiza, and to celebrate the end of summer with friends and ship-mates. And it’s true what they say… Ibiza and yachting are always a good idea..! For Bradley and Renaldo, this was a world-changing experience – a sailing opportunity of a life-time. Marine Inspirations empowers would-be seafarers who would otherwise not be exposed to – or have a glimpse into – the yachting or maritime industry. The idea is to target certain events and introduce yacht owners, captains, and sponsors, to prospective young student candidates to enable them to gain hands-on seamanship experience and to expose them to the opportunities that exist within the maritime industry.